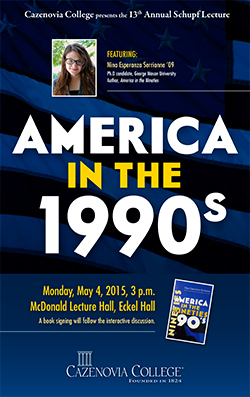 Cazenovia College's 13th Annual Schupf Lecture will feature alumna Nina Esperanza Serrianne '09, author of "America in the Nineties." Serrianne, current Ph.D. candidate at George Mason University, will come back "home" to address the campus community during her nationwide book tour at 3 p.m. on Monday, May 4, in McDonald Lecture Hall, Eckel Hall. "This distinguished campus lecture series and the chair in which I hold have been solely made possible because of the generosity of Paul J. Schupf (Hamilton, N.Y.) over the last two decades," says Dr. John Robert Greene, Paul J. Schupf professor, history and humanities; director, social sciences program; and College archivist. "It’s a pleasure to see one of the most remarkable students I have ever taught in 35 years of teaching assume this esteemed role." While at Cazenovia, Serrianne served as a Washburn Junior Teaching Fellow under Greene's advisement. The fellowship, established in 2001 by Professor Emerita and Vice Chair of the Cazenovia College Board of Trustees Marge Pinet, and named in honor of her parents, the Rev. Gordon H. and Mrs. Dorothy M. Washburn, provides two students a year-long funded opportunity to significantly expand upon his or her chosen field. One fellow concentrates on research and the other focuses on teaching. "To say that Nina is a graduate student with a published book should say it all, but she also taught alongside me, so I know she not only writes as a professional, but she teaches as a professional, as well," says Greene. In addition to her remarks, Serrianne will field questions from the audience, speak with students individually, and teach a portion of US History II; in which her book is a required text. "I hope that the lecture achieves the same goals as the book, to give the audience a deeper understanding of the 1990s," says Serrianne. "I also hope that students seeking direction in their careers will be given some insight into what you can do with a Cazenovia College degree." Serrianne will host a book signing immediately following the lecture, courtesy of the Cazenovia College Bookstore and the Office of Alumni Relations. The event will be broadcast via the College's Livestream service at the following address: new.livestream.com/cazenoviacollege/PaulJSchupf2015.